Visual artist Dominique Gonzalez-Foerster and composer Ari Benjamin Meyers’ scenic walk through Stockholm and its surroundings traces a classic story in a current reality. The one-time only performance T.451 is inspired by Ray Bradbury’s sci-fi novel Fahrenheit 451 (1953), as well as the film version by François Truffaut (1966) with music by Bernard Herrmann. In Bradbury’s original story, set in a future society, the only communication is made through TV and images. Literature is regarded as dangerous for the unified community and has thus been classified as illegal. The printed word is actively searched for and destroyed by firemen who, instead of putting out fires, burn books to prevent disillusioned human conditions. In T.451 the public becomes witness to re-enactments played out in Stockholm city and the suburb of Tensta. 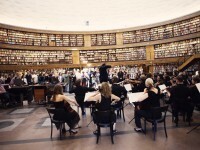 By inserting scenarios where music plays a large role into architectural environments, infrastructure, and public places such as Gunnar Asplund’s famous Stockholm Library; the Stockholm subway; and the late modernist housing area Tensta, Gonzalez-Foerster and Meyers are testing the possibility of an imagined future through a new form of musical and performed narrative. 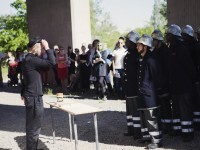 T.451 is a collaboration between Stockholm konst and Tensta konsthall, with support by Stockholm Library, Tensta Library, and Einar Mattsson AB. 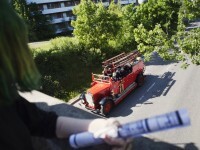 A special thanks to The Greater Stockholm Fire Brigade, the organization Röde Hanen The Stockholm City Museum, and Kurdiska föreningen Spånga. Produced by Stockholm konst.